BUTUAN CITY, Jan. 12 (PIA) -- The police force here will introduce innovations in Caraga region this year the better to safeguard public safety and maintain peace and order. 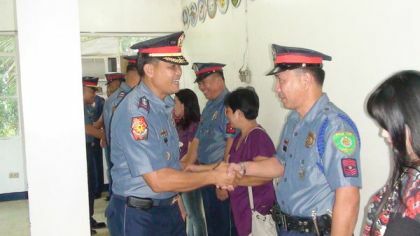 In his New Year's message, Caraga PNP Director Police Chief Superintendent Reynaldo S. Rafal said these innovations include the expansion of the e-Blotter System, which was started by the Butuan City Police Office; the implementation of the e-Warrant System, where the warrants of arrest will be placed in a data base system so that an apprehended person’s record can be easily accessed whether he has other standing warrants; and the e-Rouge System, for the convenient access of a suspect’s background information, criminal records and other of his profiles. Other innovations, Rafal said, will be announced to the public in the coming days. He also said that other anti-criminality projects which had worked well in other parts of the country may be replicated here in the region. These may include the creation of “Motorcycle Cops” to counter the “Motorcycle-riding-in-tandem” criminals, enhancing the Police Community Relations, information campaign, police visibility patrols on the streets and emphasis on the capability of the police to conduct search and rescue and relief and rehabilitation operations. Director Rafal said that per instruction from CPNP PDGen. Bartolome, the police mobile forces such as the Regional Public Safety Battalions and the City and Provincial Public Safety Companies, will conduct not only internal security operations but also disaster management operations. The director said that they will also continue with their existing campaign to arrest the wanted persons, the realization of the policeman-per-barangay and other on-going projects. Rafal commended the regional police force for a job well done in 2011, as crime volume decreased by 19.1 percent, compared to the previous year. He said that the reduction of the crime rate nationwide had also been noted by the police higher headquarters. He added the figures in the region went down even in November and December last year, when the crime volume was expected to rise due to the holiday season.